London: February 4 2019: The London Film School, the UK’s longest-standing institution for nurturing filmmaking talent in the UK, has announced Academy Award™ winning director Asif Kapadia as an Honorary Associate of the Academy. Honorary Associates are announced at the LFS Annual Showcase, held each year at the end of January. 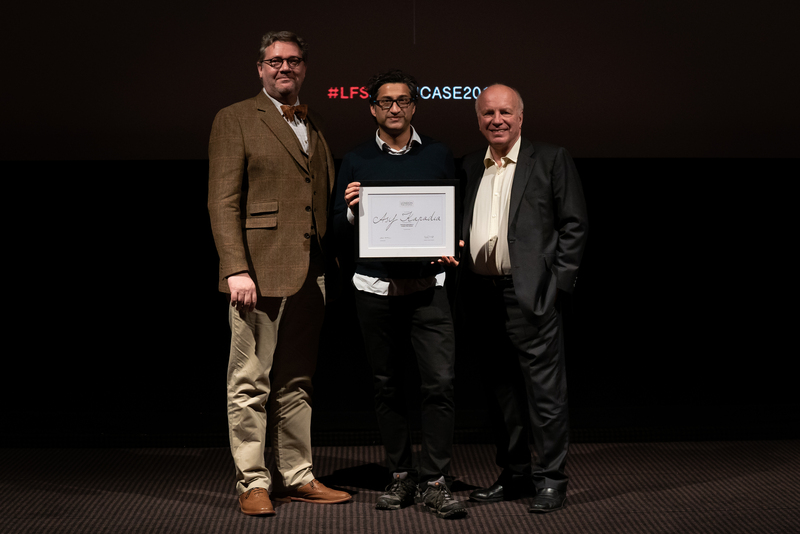 In addition to Kapadia, this year Les Blair, the BAFTA-winning television, film and theatre director, was also awarded the accolade, presented by Chairman of the School Greg Dyke, school Director Gisli Snaer and in the case of Blair, Mike Leigh- an LFS alumnus and long-standing friend. Past Honorary Associates span all areas of the screen industry and in the course of the school’s rich history, have included Abi Morgan, Amma Asante, Stephen Frears, Jim Broadbent, Christine Langan, Tessa Ross, Philip French, Ralph Fiennes, Ken Loach and Lynne Ramsay, alongside graduates of the school’s diverse film and television courses. The Associates remain an integral part of the school’s wide-ranging pool of industry experts and student mentors for years to come. The school’s Honoree programme is possible with the generous assistance of the school’s sponsors: Panalux, Final Draft and Performance Film & Media Insurance. As part of his role, Kapadia will visit the School during the coming year to conduct a Masterclass as part of the school’s long-running CONNECTS programme, a series of industry and alumni-focused events for current students. Asif Kapadia shot to fame with his internationally acclaimed documentary on the racing legend, SENNA, in 2010. Other award-winning films from the London-based director include the BAFTA-nominated THE WARRIOR (2001, the acclaimed short film THE SHEEP THIEF (2002), ALI AND NINO (2017) and the Grammy and Oscar-winning AMY (2016), the highest-grossing documentary of all time in the United Kingdom. Under the stewardship of Director & Chief Executive Officer Snaer, himself an award-winning director, the London Film School produces over 180 films annually, with 220 film students. In 2017/18, students’ projects screened at 232 film festivals and 37 awards were awarded to LFS films. Graduates go on to work in the UK screen industry as well as further afield. As part of its new vision for the future, the school will move into a new purpose-built location in London’s Docklands within the next few years. Five of London Film School’s graduates will feature as part of the Berlinale Talents programme at this month’s Berlin Film Festival, including Jacqueline Lentzou, Lorenzo Nera, Zhannat Alshanova, Joshua Magor and Lara Zeidan. For over 60 years, London Film School (LFS) has been the place for emerging creative talent to hone their craft, find their voice and engage directly with the vibrant UK screen industries. With a student cohort from every corner of the globe, LFS has always been a cultural hub where fresh voices, experiences and perspectives rub shoulders with tradition and history. The story of film has played out at the LFS’s headquarters in Shelton Street – the pull of celluloid, alongside the push of the new and the emergence of a digital world. Here, we take both seriously to celebrate a tradition of innovation. LFS is built around a conservatoire model, providing a hothouse environment for intense creative work. The London Film School MA programmes in Filmmaking, Screenwriting and International Film Business are recognised by Screenskills (Creative Skillset) as an industry standard and at a level of professionalism that has delivered the school the status of a Film Academy. The London Film School is one of only three such academies in the UK. The LFS’ staff and visiting lecturers are connected to the UK and global industries, bringing their experiences into the everyday practice of teaching at LFS. Balancing the mastering of technical skills with the creative development of ideas. Panalux is a leading lighting rental company, lighting the world of Film, TV, Commercials, and Live events to name a few. With technical expertise and unparalleled customer service, flexibility and problem solving are a part of the package. An in-house R&D department and dedicated Engineering department facilitate many projects such as customisation for productions as well as creating our own fixtures, like the Tektile, Flex light and the Hi-Lo. With offices throughout the UK, in France and South Africa, and a fleet of over 220 vehicles, our services are available globally. At Performance, our team believes that learning should be lifelong. Everyone can acquire new knowledge every day - something we continue to do ourselves. You may have found that insurers can tend to be warier of student productions, as they are perceived to carry more of a risk due to their 'inexperience' when compared to 'professional' production companies. As a result, these insurers may decline to offer you cover at all, or demand a higher premium or an increased excess (the amount you pay in the event of a claim), in order to offset this risk. We take a more balanced view and, whilst we can’t offer student discounts, we don’t penalise you either by increasing the rates, either in terms of premium or excess, just because you are a student. After all, even experienced people don’t know everything! In the future, the time will come when you leave your teachers and mentors behind and forge your own career. You can be safe in the knowledge that Performance will continue to provide you with access to expert insurance advice, gathered from decades of developing strong relationships in the film and media industry. Insurance isn’t a scary subject, but it is one that all filmmakers should understand. Let Performance take care of that for you, so that you can concentrate on putting together your next big movie!